This is probably one of the best sculpts that Tonner did. I wanted a gentler Edward, one like Heathcliff, a dark side but still you could see a loving face. I gave this doll a major haircut and sculpted the hair with gel and dabbing of hairspray. Held by little rubber bands as it dried, but taking them off so they won't leave a mark on the hair. 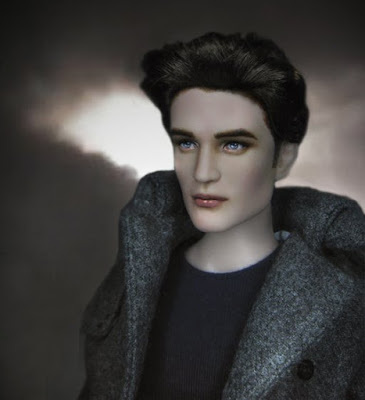 By sculpted that means arranging the hair so that it looks proportional to the face -- less doll-like. The eyes appear blue here but they're actually black with some greys and whites. And of course those little points in the black that glisten. The hardest part for me were the lips. It is hard to find the right solution or mix of paints to capture the actor's lip color (which was actually stained/tinted red) in the film. The sides that frame the face have been painted on too. 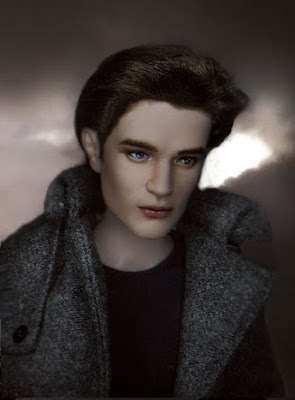 Edward's face is not rectangular in Twilight but rounded at the top because of hair that falls to the side of his temples. The eyebrows were brushed with a ratio of 3 parts water 2 parts paint then it progresses from there. I wish I had more patience and new brushes though. Thank you very much Terri. Right now as I write (November 2009), a lot of wonderful Twilight repaints have come up, there's Isabelle Repaints version of Edward and Noel Cruz's Twilight Prom Bella and Edward. Both wonderful interpretations of Edward. I cannot even compare myself to these two super-fabulous doll repainters. They are my inspirations. This is simply unbelievable. Do you take commissions? Please e-mail me at missmerbella (at) gmail.com. Thank you!